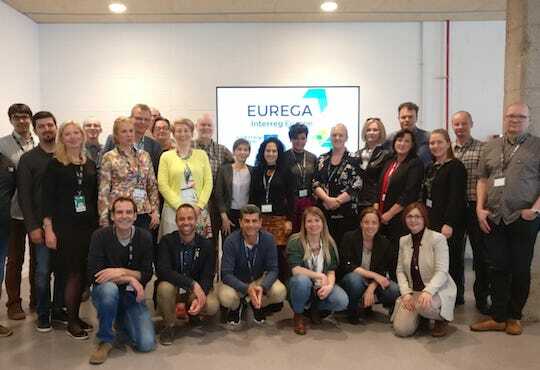 Highlighting the link between gastronomy and education was the aim of the second Interregional Exchange Visit of the EUREGA project that took place in Catalonia on 26-29 March 2019. The meeting gathered 25 representatives of the 9 European partners involved in the project and offered them the chance to experience and learn from some of the most outstanding good practices developed in Catalonia to connect the two fields. Learning opportunities included: CETT international school for education and knowledge transfer in tourism, hotel management and gastronomy, affiliated to the University of Barcelona; Alicia Foundation, a research centre investigating cooking, foods and culinary processes to improve eating habits, highlighting the food and gastronomic heritage of the region; LABulligrafia, a project led by Ferran Adrià devoted to collect and display the legacy of knowledge, creativity, innovation and entrepreneurship generated by the famous Catalan chef and his team; and the Culinary Institute of Barcelona, a brand-new cooking school promoting innovative and creative learning methods for a holistic professional training of 21st century cooks. The meeting, hosted by PRODECA (Catalan Agrifood Exports Promotion Agency) focused also on the relationship between gastronomy and health, analysing Catalonia’s Public Food Procurement Plan, the Health Department’s PAAS programme for promoting health through physical exercise and healthy eating, and several other programmes designed to encourage good eating habits in schools. The 9 partners involved the Eurega project are: the Municipality of ‘s-Hertogenbosch and the Province of Noord-Brabant (North Brabant, European Region of Gastronomy awarded 2018 – Netherlands); the Northern and Western Regional Assembly (Galway-West of Ireland, European Region of Gastronomy awarded 2018 – Ireland); Sibiu County Council (Sibiu, European Region of Gastronomy awarded 2019 – Romania); the Development Agency of South Aegean Region – READ S.A. (South Aegean, European Region of Gastronomy awarded 2019 – Greece); ProAgria Pohjois-Savo (Kuopio, European Region of Gastronomy awarded 2020 – Finland); PRODECA – Government of Catalonia (Catalonia, European Region of Gastronomy awarded 2016); Hajdú-Bihar County Government (Hungary); and IGCAT. IGCAT is the Advisory Partner of EUREGA, offering expert advice to help the regions involved work on their challenges and objectives, and is in charge of monitoring and evaluating the project’s results.